Joseph has always been a cheerful, bold little character. I remember, when he was almost one, taking him for a blood test. He lay on a bed whilst 2 nurses put the cannula in, I was showing him a Dumbo elephant with flappy ears. He stopped playing for a minute, turned his head, and watched them draw the blood. Had a smile, turned his head back, and kept on playing and laughing. The nurses were amazed. But if he's walking in the hall way and wants to go into a dark room he stands at the door way, clinging on to the frame saying "dark dark, scary dark" until he's rescued! Our light switches are all too high for him to reach! On our London trip this week, we went to the aquarium. He was stood by a tank which was right at his level, and a few stingrays came flopping towards him, and he hid behind my legs! I said to him "it's ok to be frightened but it's important we face our fears and deal with them" so out he popped, laughing and smiling at these funny creatures. Joseph hid again, shaking. I smiled and said "Joseph remember what I said?" 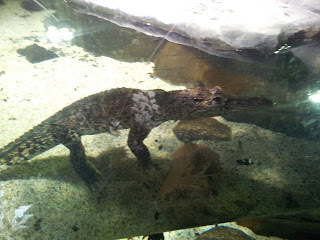 So he popped out, looked at it intently and said in a loud cheery voice "well good morning Mr Crocodile!" So very cute! I'm finding this age Joseph has reached endlessly fascinating, its so amazing to see what he recalls and what he finds important. I love it. That's so cute :) We had to deal with a fear of public toilets for a long long time. It was hard & stressful but we worked on it & gradually things improved.